Kathryn S. Jaekel, Ph.D., joined NIU in the fall of 2015 and teaches courses on diversity, critical multiculturalism, and pedagogy. Before joining the NIU faculty, Jaekel was the assistant director for First-Year Writing at Iowa State University and helped administer the curriculum for over 7,000 undergraduate students. In this position, Jaekel also trained and mentored novice college educators to teach the curriculum. In addition, Jaekel served as a Women’s and Gender Studies instructor teaching courses on Queer Studies and LGBTQ-themed courses. Jaekel’s prior experience includes serving as the program coordinator for Iowa State University’s Dialogues on Diversity for three years. Dialogues on Diversity is a multi-section undergraduate course that centered learning about power, privilege and diversity. In that role, Jaekel administered curricula, facilitator training, as well as student and programmatic assessments. 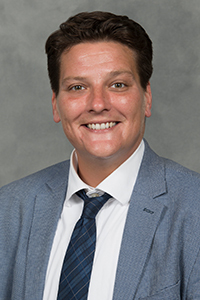 Jaekel’s research focuses on first-year student experience, LGBTQ students experience in the classroom, and novice postsecondary educators’ preparation, training and development. Additionally, Jaekel writes about using critical pedagogy in the classroom to support non-dominant students’ learning.